A Christmas movie in November? This year, we’re alright with that. There’s something specific about a Christmas movie. Of course, there’s the evocative Christmas imagery, but there’s also an atmosphere to the season that permeates Christmas movies like the smell of gingerbread at your grandparents’ house. The Grinch, the latest adaptation of the classic Dr. Seuss story How the Grinch Stole Christmas, might not be the most high-quality holiday movie you’ve ever seen, but it nevertheless strikes that intangible Christmas note, and in a season dominated by regal dramas, niche actioners and weighty biopics, that note has a cheerful ring to it. This is only the third Grinch movie (surprised? it feels like more). The original Chuck Jones TV special from 1966 remains a classic, but the 2000 live-action version starring Jim Carrey? Not so much. The cartoon short (only 26 minutes!) captured the book’s Seussian style and cheek to marvelous effect, but the Ron Howard movie rendered everything twisted and grotesque and somehow anti-holiday. That movie was a lot of things, but it was not Christmas. 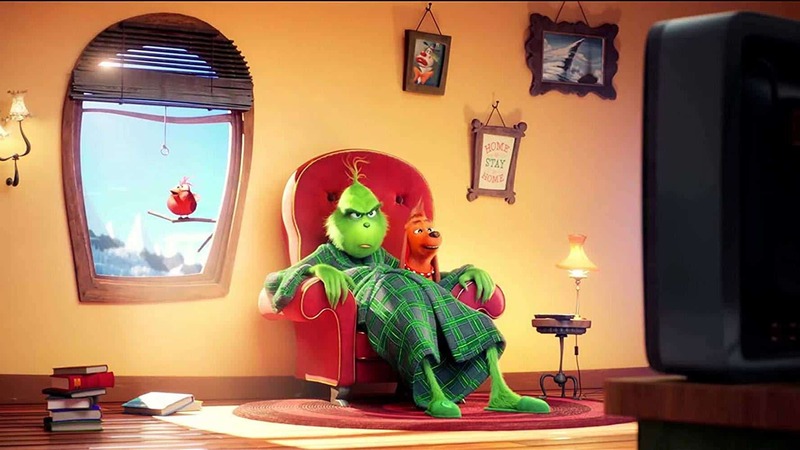 Coming from the same studio as Minions and Despicable Me, this new Grinch carries a zany tone that lands somewhere between its previous iterations. It’s cartoony and slapstick, but it’s purer at heart than the live-action movie. The Grinch has a message at least, and though it’s not exactly profound and comes with some regrettable “2018” jokes related to booty shorts and hip-hop tracks, at its core it’s quite Christmas-y, and that’s appreciable. The holidays aren’t always a safe time to go to the movies, but there are usually some options that offer refuge from the prestige movies and their myriad attempts at heartbreak, profundity or introspection. For every Phantom Thread, there’s usually a Jumanji. The Grinch thus comes at an opportune moment when Halloween horror has run out of gas and the less prominent prestige flicks like Suspiria and Boy Erased are making ill-fated grabs at Oscar buzz. On the holiday-movie table, The Grinch is a bit of an appetizer (don’t worry, awards-season hams The Favourite, Widows and If Beale Street Could Talk are about to be served). It’s the simplest of Christmas movies, delivering a light message of love that’s sure to appease parents and satisfy kids. No It’s A Wonderful Life-esque musings here, but whatever; it’s November. What The Grinch does offer are some quality high jinks and decent physical gags. The Despicable Me folks always have fun with gadgetry, so it’s a joy to see them apply their cartoonish gizmos to the Grinch’s famous Christmas heist. It’s the best sequence in the movie. The getaway sleigh has never looked more imaginative, and the montage of thievery that showcases the green guy’s caper is a good deal of fun. Aside from Benedict Cumberbatch’s serviceable grouchiness as the Grinch, you have nice voice work here from Rashida Jones (Mrs. Who, easy to like), Kenan Thompson (a Christmas-crazy Who named Bricklebaum, a scene-stealer) and Cameron Seely (Cindy Lou Who, spunkier and frankly more endearing here than past renditions). Cindy Lou Who is a full character in The Grinch, with motivations and conflicts and a few nice action moments, and though she’s not complicated, she adds a nice sprinkle of attitude to a movie that could have been bogged down easily by repetitive Grouchy Grinch vs. Cheery Who jokes. But really, the biggest reaction to The Grinch is that, despite its shortcomings, it carries that intangible Christmas feeling you want in a holiday movie. Whoville is a heart-stirring sight when decorated with its tree and lights and garland galore, and the subsequent images of glistening Christmas dinners and sparkly presents and fuzzy red Santa suits all serve to wrap you up like a thick blanket and settle you by the fire. So even if The Grinch can’t take you all the way to that home-can-be-anywhere Christmastime feeling, it does fine in helping you take your first step. You might not walk out of this movie thinking about anything it’s trying to say, but you’ll be thinking about cocoa and cookies and people you love. This time of year at the movies, and this time of year in general, that’s certainly a welcome thing.